Cognitive-Theoretic Model of the Universe (CTMU) – a theory of reality developed in the mid-1980’s by Christopher Michael Langan. Some of the basic principles are discussed on this page, but will be better understood in the context of the complete theory. Reality Principle – The real universe contains all and only that which is real. 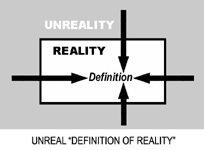 The reality concept is analytically self-contained; if there were something outside reality that were real enough to affect or influence reality, it would be inside reality, and this contradiction invalidates any supposition of an external reality (up to observational or theoretical relevance). Syndiffeonesis – The expression and/or existence of any difference relation entails a common medium and syntax. Reality is a relation, and every relation is a syndiffeonic relation exhibiting syndiffeonesis or “difference-in-sameness”. Therefore, reality is a syndiffeonic relation. Syndiffeonesis implies that any assertion to the effect that two things are different implies that they are reductively the same; if their difference is real, then they both reduce to a common reality and are to that extent similar. Syndiffeonesis, the most general of all reductive principles, forms the basis of a new view of the relational structure of reality. 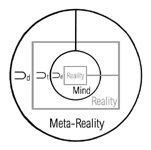 Metaphysical Autology Principle (MAP) – All relations, mappings and functions relevant to reality in a generalized effective sense, whether descriptive, definitive, compositional, attributive, nomological or interpretative, are generated, defined and parameterized within reality itself. In other words, reality comprises a “closed descriptive manifold” from which no essential predicate is omitted, and which thus contains no critical gap that leaves any essential aspect of structure unexplained. Any such gap would imply non-closure.. Mind Equals Reality Principle (M=R) asserts that mind and reality are ultimately inseparable to the extent that they share common rules of structure and processing..
Multiplex Unity Principle (MU) – The minimum and most general informational configuration of reality, defines the relationship holding between unity and multiplicity, the universe and its variegated contents. Through its structure, the universe and its contents are mutually inclusive, providing each other with a medium..
Determinacy and indeterminacy…at first glance, there seems to be no middle ground. Events are either causally connected or they are not, and if they are not, then the future would seem to be utterly independent of the past. Either we use causality to connect the dots and draw a coherent picture of time, or we settle for a random scattering of independent dots without spatial or temporal pattern and thus without meaning. At the risk of understatement, the philosophical effects of this assumed dichotomy have been corrosive in the extreme. No universe that exists or evolves strictly as a function of external determinacy, randomness or an alternation of the two can offer much in the way of meaning. Where freedom and volition are irrelevant, so is much of human experience and individuality. But there is another possibility after all: self-determinacy. Self-determinacy is like a circuitous boundary separating the poles of the above dichotomy…a reflexive and therefore closed boundary, the formation of which involves neither preexisting laws nor external structure. Thus, it is the type of causal attribution suitable for a perfectly self-contained system. Self-determinacy is a deep but subtle concept, owing largely to the fact that unlike either determinacy or randomness, it is a source of bona fide meaning. Where a system determines its own composition, properties and evolution independently of external laws or structures, it can determine its own meaning, and ensure by its self-configuration that its inhabitants are crucially implicated therein. A fundamental process that tends to maximize a cosmic self-selection parameter, generalized utility, over a set of possible syntax-state relationships in light of the self-configurative freedom of the universe. 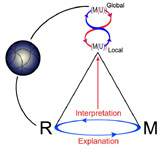 An inherently “quantum” process that reflects the place of quantum theory in SCSPL, telic recursion is a “pre-informational” form of recursion involving a combination of hology, telic feedback and recursive selection acting on the informational potential of MU, a primal syndiffeonic form that is symmetric with respect to containment. Teleologic Evolution (TE) is a process of alternating replication and selection through which the universe “creates itself” along with the life it contains. This process, called telic recursion, is neither random nor deterministic in the usual senses, but self-directed. Telic recursion occurs on global and local levels respectively associated with the evolution of nature and the evolution of life; the evolution of life thus mirrors that of the universe in which it occurs. TE improves on traditional approaches to teleology by extending the concept of nature in a way eliminating any need for “supernatural” intervention, and improves on neo-Darwinism by addressing the full extent of nature and its causal dynamics. In the past, teleology and evolution were considered mutually exclusory. This was at least partially because they seem to rely on different models of causality. 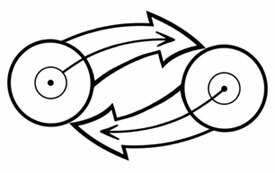 As usually understood, teleology appears to require a looping kind of causality whereby ends are immanent everywhere in nature, even at the origin (hence the causal loop). Evolution, on the other hand, seems to require a combination of ordinary determinacy and indeterminacy in which the laws of nature deterministically guide natural selection, while indeterminacy describes the “random” or “chance” dimension of biological mutation. In contrast, the phrase teleologic evolution expresses an equivalence between teleology and evolution based on extended, refined concepts of nature and causality. This equivalence is expressed in terms of a self-contained logic-based model of reality identifying theory, universe and theory-universe correspondence, and depicting reality as a self-configuring system requiring no external creator. Instead, reality and its self-creative principle are identified through a contraction of the mapping which formerly connected the source and output of the teleology function. In effect, the creative principle itself becomes the ultimate form of reality. The self-configuration of reality involves an intrinsic mode of causality, self-determinacy, which is logically distinct from conventional concepts of determinacy and indeterminacy but can appear as either from a localized vantage. Determinacy and indeterminacy can thus be viewed as “limiting cases” associated with at least two distinct levels of systemic self-determinacy, global-distributed and local-nondistributed. The former level appears deterministic while the latter, which accommodates creative input from multiple quasi-independent sources, dynamically adjusts to changing conditions and thus appears to have an element of “randomness”. According to this expanded view of causality, the Darwinian processes of replication and natural selection occur on at least two mutually-facilitative levels associated with the evolution of the universe as a whole and the evolution of organic life. In addition, human technological and sociopolitical modes of evolution may be distinguished, and human intellectual evolution may be seen to occur on collective and individual levels. Because the TE model provides logical grounds on which the universe may be seen to possess a generalized form of intelligence, all levels of evolution are to this extent intelligently directed, catalyzed and integrated. Reality Theory is about the stage of attribution in which two predicates analogous to true and false, namely real and unreal, are ascribed to various statements about the real universe. In this sense, it is closely related to sentential logic. In particular, sentential logic has four main properties to be emulated by reality theory. The first is absolute truth; as the formal definition of truth, it is true by definition. The other properties are closure, comprehensiveness and consistency. I.e., logic is wholly based on, and defined strictly within the bounds of, cognition and perception; it applies to everything that can be coherently perceived or conceived; and it is by its very nature consistent, being designed in a way that precludes inconsistency. The Principle of Linguistic Reducibility – Reality is a self-contained form of language. This is true for at least two reasons. First, although it is in some respects material and concrete, reality conforms to the algebraic definition of a language. That is, it incorporates (1) representations of (object-like) individuals, (space-like) relations and attributes, and (time-like) functions and operations; (2) a set of “expressions” or perceptual states; and (3) a syntax consisting of (a) logical and geometric rules of structure, and (b) an inductive-deductive generative grammar identifiable with the laws of state transition. Second, because perception and cognition are languages, and reality is cognitive and perceptual in nature, reality is a language as well. According to the Reality Principle, the universe is self contained, and according to infocognitive monism, it regresses to a realm of nil constraint (unbound telesis or UBT) from which it must refine itself. According to the Telic Principle, which states that the universe must provide itself with the means to do this, it must make and realize its own “choice to exist”; by reason of its absolute priority, this act of choice is identical to that which is chosen, i.e. the universe itself, and thus reflexive. I.e., “existence is everywhere the choice to exist.” Accordingly, the universe must adopt a reflexive form in which it can “select itself” for self-defined existence, with the selection function identical to that which is selected. This means that it must take a certain general or “initial” form, the MU form, which contains all of the requisites for generating the contents of reality. Due to hology, whereby the self-contained universe has nothing but itself of which to consist, this form is self-distributed. By the Principle of Linguistic Reducibility, reality is a language. Because it is self-contained with respect to processing as well as configuration, it is a Self-Configuring Self-Processing Language or SCSPL whose general spatiotemporal structure is hologically replicated everywhere within it as self-transductive syntax. This reduces the generative phase of reality, including physical cosmogony, to the generative grammar of SCSPL. a primordial realm of infocognitive potential free of informational constraint. In CTMU cosmogony, “nothingness” is informationally defined as zero constraint or pure freedom (unbound telesis or UBT), and the apparent construction of the universe is explained as a self-restriction of this potential. 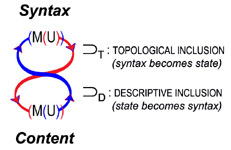 In a realm of unbound ontological potential, defining a constraint is not as simple as merely writing it down; because constraints act restrictively on content, constraint and content must be defined simultaneously in a unified syntax-state relationship. a logical analogue of holography characterizing the most general relationship between reality and its contents. It is a form of self-similarity whereby the overall structure of the universe is everywhere distributed within it as accepting and transductive syntax, resulting in a homogeneous syntactic medium. Holotheism is the theological system implied by logical theology. Its fundamental premise is that the Mind of God is the ultimate reality…that is, reality in its most basic and most general form. It is thus related to panentheism, but in addition to being more refined, is more compatible with monotheism in that its “mental” characterization of God implies that divine nature is more in keeping with established theological traditions. Theology is ordinarily understood as the study of God and the relationship of God to the world, usually in the context of a specific theological system and a related body of theological opinion. It is considered to embrace the investigation of spirit, the human soul, teleology and divine qualities such as omniscience, omnipresence and omnipotence. Traditionally, its preferred methods of inquiry have been rational rather than empirical, and have thus relied on a combination of faith and logic rather than observation. Logical theology shifts theological inquiry in the direction of logic and mathematics, seeking to reposition it within the domain of modern analytical tools including model theory, the theory of formalized systems, and the logical theory of reality. Whereas standard theology takes the existence of God as axiomatic and then attempts, often naively, to characterize the relationship between its assumed definition and a more or less concrete model of reality, logical theology explores a logical formulation of ultimate reality for any divine properties that might naturally reveal themselves; given that divine law (if it exists) would necessarily incorporate the laws of logic and mathematics on a basic level, it seeks evidence of divinity in the context of a reality-theoretic extension of logic, the CTMU. The implied convergence of theology, mathematics and science yields a reality-based theological framework with the strength and capacity to support realistic solutions to various real-world problems. a concept central to the spiritual philosophies of holotheism and panentheism. The diagram above illustrates the Hologic Identity between the self and the universe and the spirit. Hologic Identity is based on the CTMU principles of hology and syndiffeonesis.